Currently, we know there are at least 55 remaining vehicles total. Five of these are Model 15 coupes, 4 are Model 22 Broughams and the rest are Model 27(L) Brougham's. There are no known remaining trucks (except one Model 27L built on a Model 27D chassis) or the Model 16 delivery. There are also no known remaining Milburn Model 151 Roadsters, 4-passenger front steering 1922 Model 27F, nor any remaining Milburn taxis, towncars or limousines. 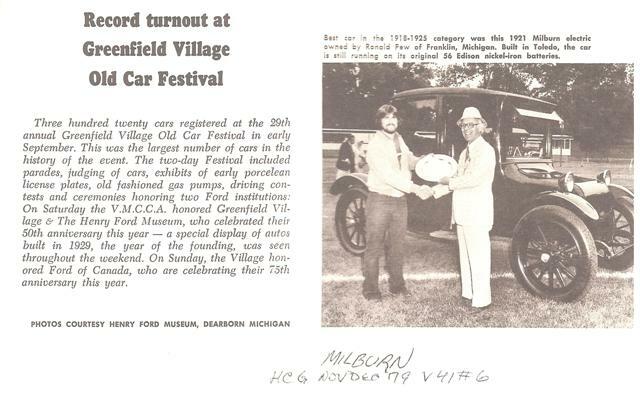 In recent decades, dozens of Milburn Electrics have been on display, on the road, or in possession of those who at one time or another wrote about their car, attended parades or otherwise were known to exist in a museum or private collection. These vehicles are now either in hiding, gone or they are one of the cars in our register, but we just don't know it. Resolving some of these questions is the goal of this webpage and investigation. Maybe you recognize one as a car already on our Register. Maybe you know of one having been sold, and to whom. Can you help us identify or track down any of these Milburns? Send us a note! Item 1. 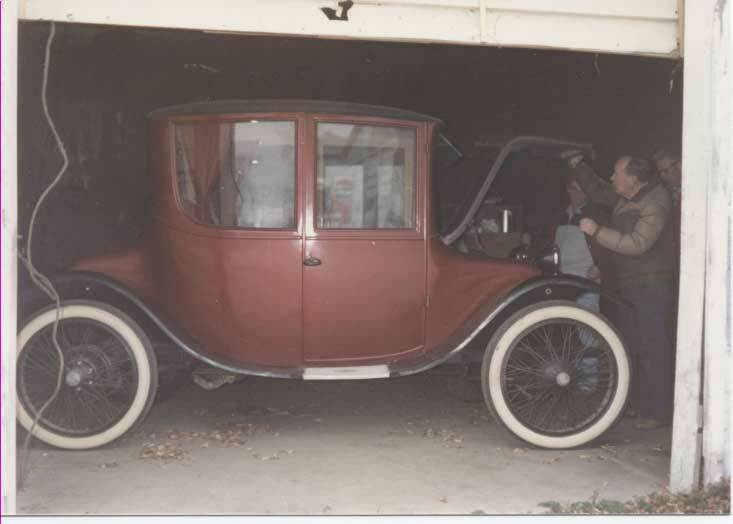 "2007 Photo/ad/caption: 1915 Milburn Electric Model 15" listed for auction August 25, 2007 by Hidden Gems auction. Car apparently didn't sell. Unfortunately, we have no better information than this. Is this car really a Model 15? It has a front bumper, which is not found on any known Model 15 and the headlamps appear to be too low, too far forward and larger than Model 15 lamps. Therefore, it seems that this more likely a '16-'23 Model 22/27(L) with front bumper, blue paint and red wheels. Item 2. Handwritten note from the 1990's: 'Cowen@sunny.mcnc.cc.mi.us 20Milb 217937'. The contact hasn't been confirmed. It's clear that this is a 1920 Milburn S/N and that there is no known Milburn with that S/N. Item 3. 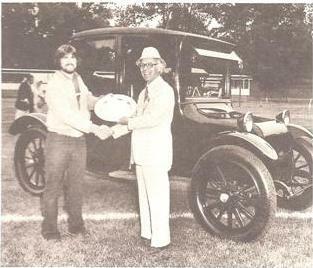 1979 Photo: 1921 Milburn Electric Model 27L with captioned photo in HCG Nov/Dec 1979 v41#6: The owner, Ronald Pew, was shown receiving an award at the Greenfield Village Old Car Festival. It is suspected that this may be the 1920 Milburn Model 27L owned by the Parauzas, which has an unknown history during this period, but may well have been in the Detroit area from the 70's to the present day. Or perhaps it's Ron Milburn's car? Item 4. 1970's Photo of burgundy or brown 1921+ Model 27L. This car was owned by Jim Murray of Galva, Ill. when the picture was taken. He bought it from someone in Kansas and sold it to someone in California. * Body color burgundy with black fenders. We know more about the car that was auctioned than we do about Jim Murray's car. So far we do not have solid connection between the two, but in all likelihood, these are the same car given these common features. Another possibility: The Wilford Taylor car (#2-2916-7) is possible. 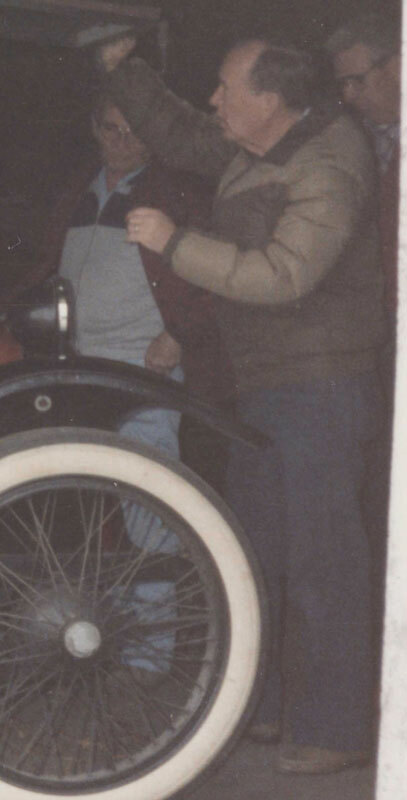 He purchased his car in the late 70's from someone in San Francisco and didn't know any other history on it, or its S/N. 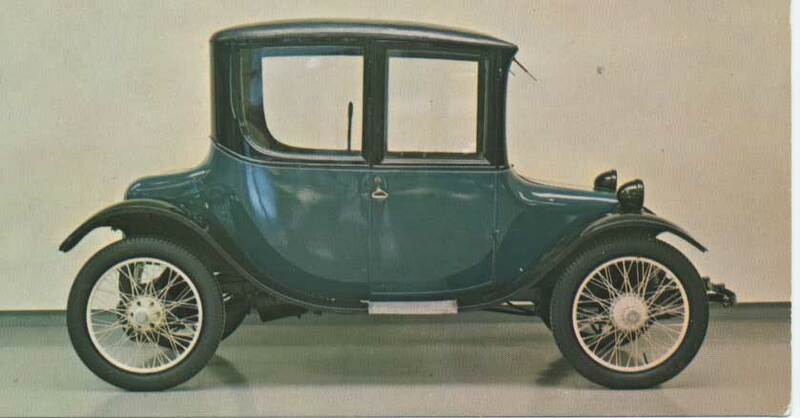 However, based on other unique details of Taylor's car, it is certainly the same car as the missing Robert P. Ebisch car that was in the 1957 registry of antique automobiles as a 1922 Milburn #229167 ("Model 30A"). Item 6. 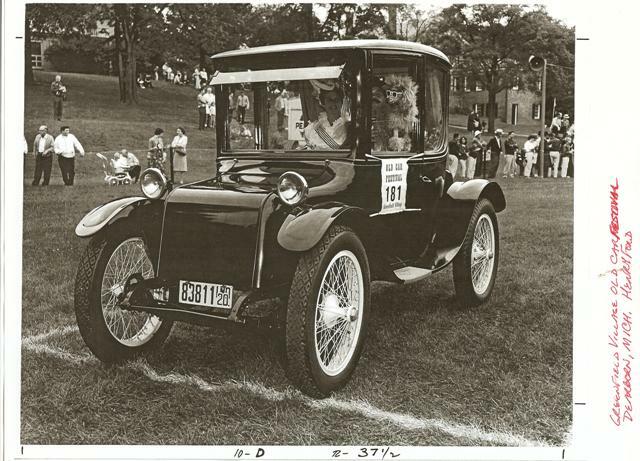 1967 Photo: "Joan Parkinson", "Feb 28, 1967 Received Examiner Reference Library"1914 Milburn Light Electric": Key things to note: Model "2" frame (22, 27(L)), wood wheels (22, 27 typ)---dark with lighter pinstripes!, rain visor, possibly 1921+ headlamps. Item 8. 1963 Ad/Photo: Oliver Family "1914 Milburn Light Electric": Mar/Apr 1963 HCG ad with picture owned at that time by Paul Kohler of Mishawaka, Indiana. Key things to note: Model "2" frame (22, 27(L)), wood wheels (22, 27 typ), considered "excellent original condition", but needed tires and batteries. What makes this Milburn most interesting perhaps is the claim that this was originally owned by the Olver Family of South Bend. George Milburn worked for the Oliver Family's farm equipment business in the 1800's before starting the Milburn Wagon Company and moving it to Toledo, Ohio. This fact makes this an interesting car. Item 10. 1949 Photo/Caption: A.C.Baker "1917" Model 27L: Photo in March 1949 HCG v11#1 pg39 as being owned by A.C.Baker. Item 1 (identified). Postcard of a pink "1914 Millburn" #9922. Lars-G�ran Lindgren of Sweden has ventured an identification of this car in a surprising location -- Denmark! Lars says: "I found an article with the Denmark Milburn (see JPG-picture). 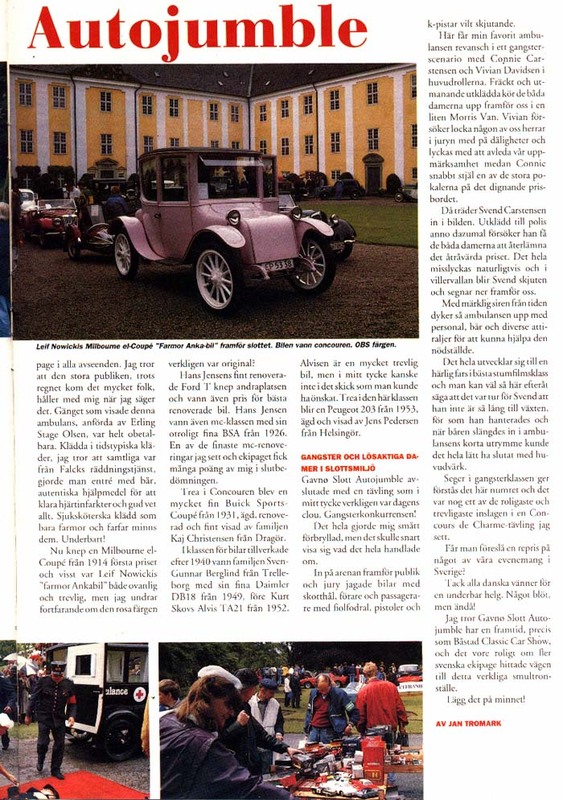 This article, Gavn� Slott Autojumble, is from the magazine 'Classic Motor' no 10 Oct 1991. The 1914 Milburn won first prize in the Concours de Charme-competition. I think this car is the missing Milburn no 1." Lars is right. Both cars are pink with pink running gear (a very rare color for Milburns) with cream or pink wood-spoked wheels; both have white wavy curtains inside; both have glass visors over the front window; and both are cited as "1914" models (Milburns began with the 1915 model year with Coupe, Roadster and Delivery models. 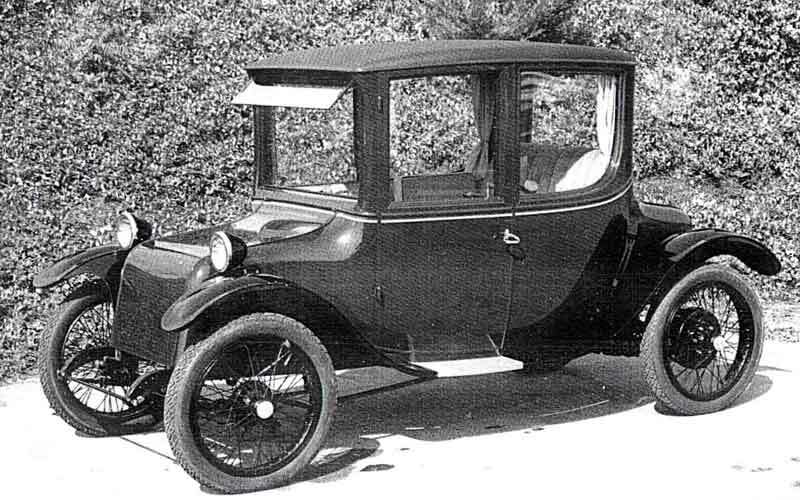 The Brougham style like this one wasn't available until late 1915 at the earliest). New information, January 6, 2008: Bob Kavanaugh, of Montreal Canada, writes "My father, Gordon, had the Milburn restored and painted pink in the early '60's. At that time he had an extensive antique car collection. As I recall, he purchased it in the north east USA. It was part of his collection which he displayed in the X-British pavilion in 1968.The building was on the EXPO 67 Worlds Fair site in Montreal in 1967." 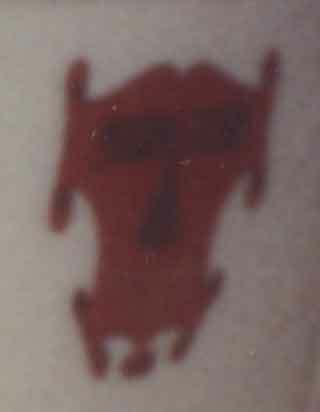 Item 2 (Identified). Postcard picturing a 1916 Milburn. 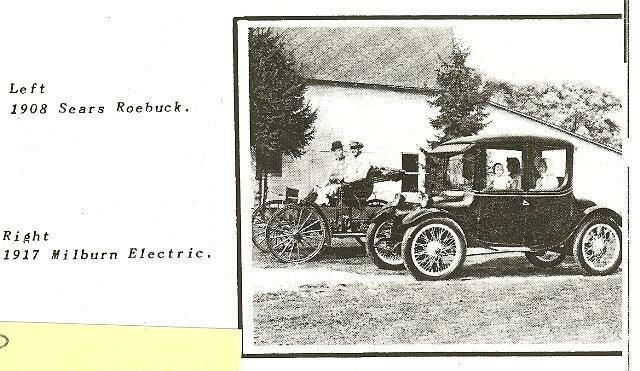 Mr. and Mrs. Eugene Hawkins were the original owners, the last electric car in regular use in New York. Mr. Hawkins bought it new for his wife on their wedding day in 1916 and Mrs. Hawkins drove the car for 40 years before donating it to the Long Island Automobile Museum. It was sold at auction from the museum as part of the Henry Austin Clark collection in 1972. At that point, the car disappeared. Meanwhile, Remy and Elisha Baker's car was purchased in the 80's from a broker in Massachussets who bought it from an antique dealer in NY. There is a plaque on the dash that says "Tom McDonald". 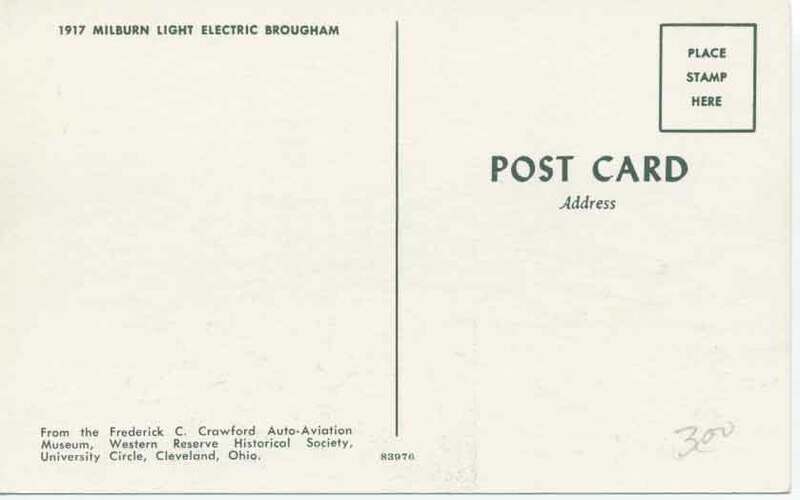 Based on a host of factors, it is believed that the vehicle in the postcard is the Model 22 owned by Remy and Elisha Baker in South Carolina. These factors include: NY 1916 license, artillery wheels with whitewall tires, identical paint and pinstriping and a history that fits. Item 3 (identified). 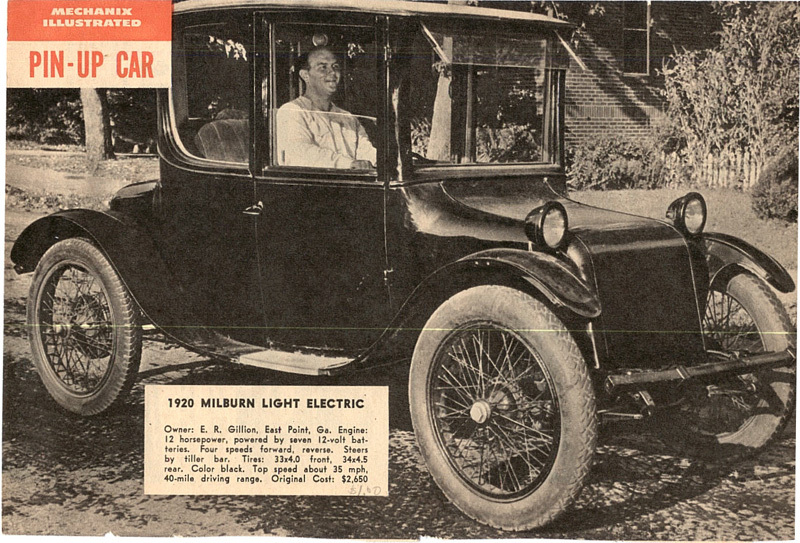 Postcard picturing a 1917 Milburn. This car was part of the Crawford Auto-Aviation Museum collection up until the 80's, when it was sold at auction. It may be the same as #4 below. 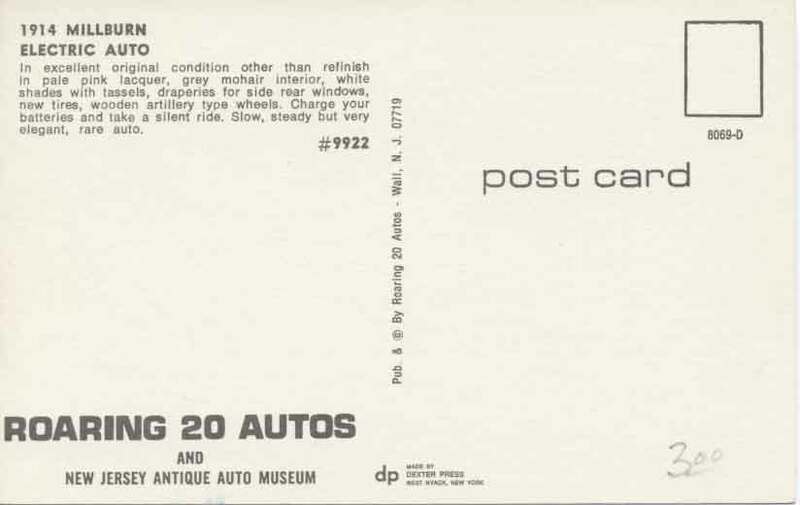 Research Note: This is confirmed to be the Cauffiel Milburn, though the color on the postcard fooled us as the car appears green there. 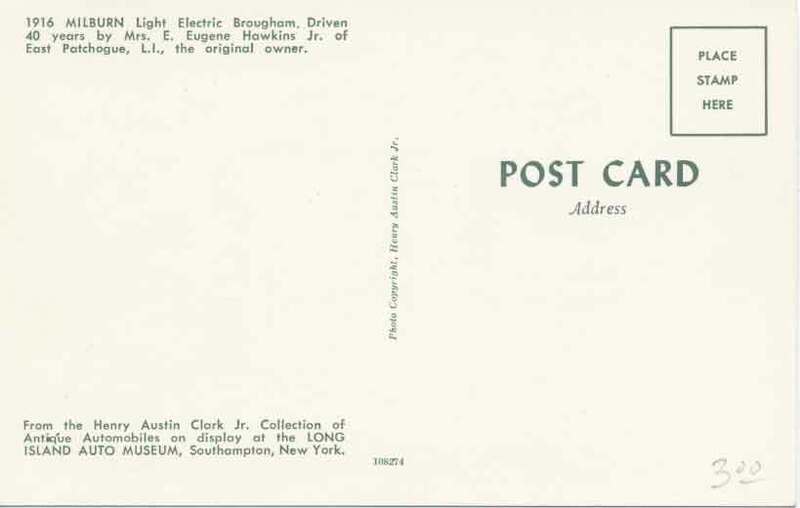 Phyllis Cauffiel confirmed on 12/14/08 that their car was bought in 1995 from a Douglas Rhode who had bought the car from the Crawford Museum, Cleveland, Ohio (was an engineering school and museum---only collected Ohio cars). Curator got rid of cars he didn't want. Item 4 (likely identified). Photo of a 1917 Milburn "Sold at auction Sept. 1986." This car may be the same as #3 above and is likely the Cauffiel Milburn. Item 5 (identified). 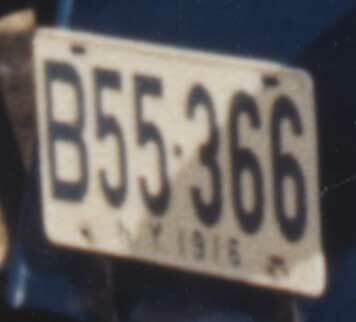 Photo of MLE with a tag that appears to read "NY 1916". It turns out that this car is Remy Baker's Milburn, already on our Registry page. Now, can anyone tell us about its history? 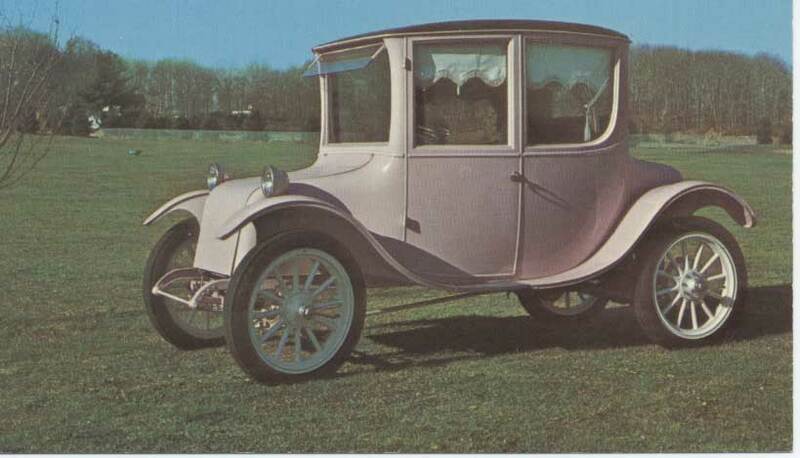 This vehicle has appeared in Horseless Carriage Gazette, Automobile and the Standard Catalog of American Cars. The same photo that is in the Standard Catalog is on a postcard and the photo #2 above. Item 6 (likely identified). Photo of cream-colored MLE Brougham with a design on its door. Best Hunch: Comparing this car to existing known Model 22 or 27(L) Broughams, the distinct wavy curtains stand out. There are only 2 remaining Milburns with this type of curtain, and only one of those vehicles has artillery wheels like this one: The Egeskov Castle "pink" Milburn in Denmark. 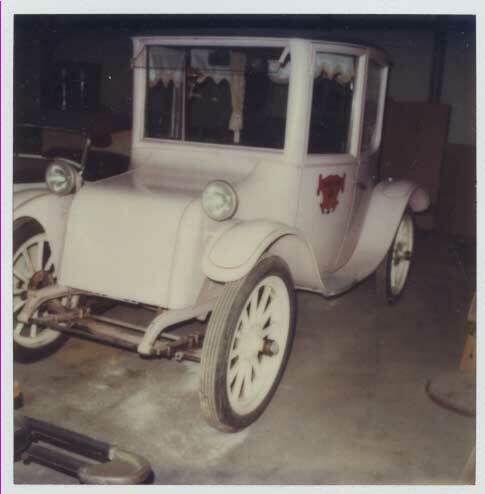 Given that the pink Milburn was painted in the early 60's in Canada, it would fit that this vehicle is the same car, but in the U.S., before it was brought to Canada and painted. Item 7 (Now located). 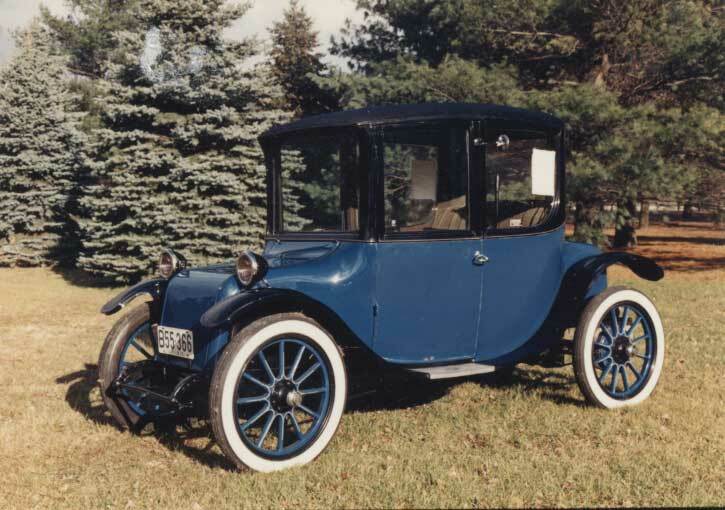 This 1921 Milburn Electric was sold by Bernard Berman of Allentown, PA, to a battery company around Allentown; Guy L. Davis of the Boyertown Electric Group has identified it as the car (#2-1046-7) now on display in the Boyertown Museum, already listed on our Registry page as a 1919 Model 27L. Item 8 (likely identified). E.R. 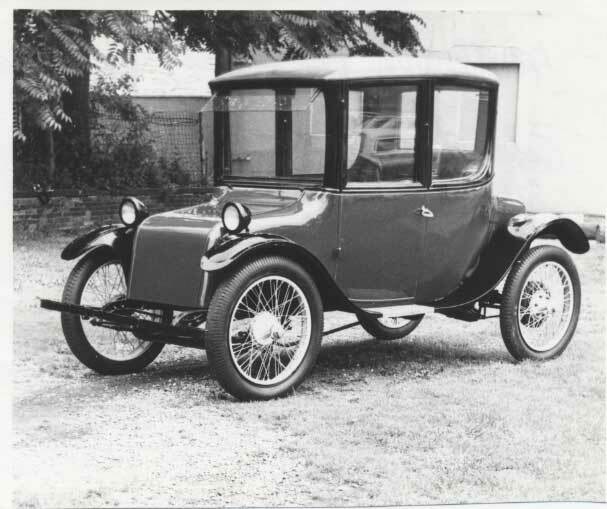 Gillion 1920 Model 27L car---from a 1950's era Mechanix Illustrated photo. Key identifiers for this car include: (1) original Milburn diamond shaped front and rear bumpers, (2) Firestone Non-Skid tires and particularly 33x4" front, 34x4 1/2" rear, (3) East Point, GA owner in the 50's and (4) appeared to be black in color, with black wire wheels. Anyone know where this car's history or where it is now? Best Guess: The Hyman Motors #2-1649-7 is the same car. There are indications that this car is either Ron Milburn's #2-1649-7 or the Hyman Motors Milburn (for sale and formerly owned by the Stone Mountain Antique Car and Treasure Museum in Georgia) #2-1416-7 car. Both of these cars are 1920 Model 27L cars and are listed on our Registry page. Ron's car particularly has both Front and Rear diamond shaped original Milburn bumpers, is noted to have 34x4 1/2" tires (need confirm if same is on front or if they are 33x4" as with the Gillion car) and finally, minor note: Georgia's not too far from Florida! However, the Stone Mountain car (prior to ownership by Hyman), was photographed as also having non-skid tires as well as a Milburn diamond shaped bumper in the front (unknown regarding the rear). To not discount the importance of the bumpers, there are only 2 of the registry Milburns that currently have the Milburn diamond shaped bumper---Ron's Model 1920 27L and the Central Texas Auto Museum 1917 Model 27 (#2-381-7). The Hyman/Stone Mountain car does not apparently still have its diamond shaped bumper. So assuming the rest of the cars which had bumpers in the 50's when this photo was taken are still wearing them, only the Ron Milburn and Hyman Model 27L's could possibly match this Model 27L that was Gillion's in the 50's. 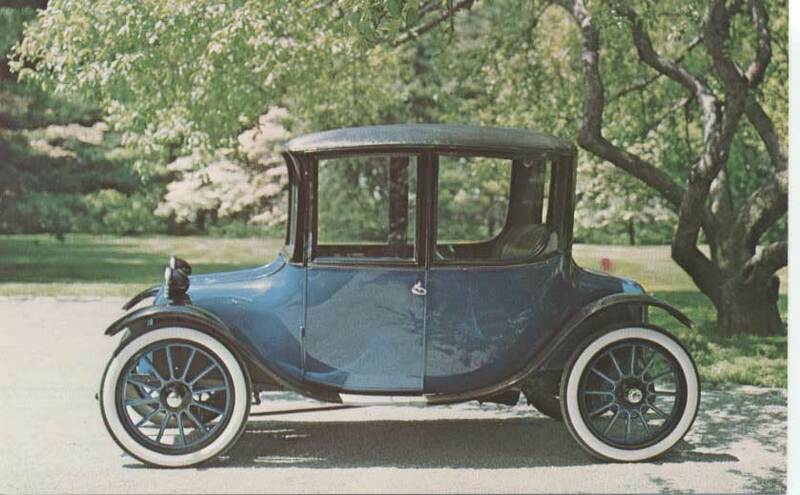 Given that the Hyman/Stone Mountain car is also the same 1920 Model 27L advertised for sale in 1957 and was then owned by Dr. Charles Adams of Atlanta, Georgia it is best hypothesized that Gilliam purchased the 1920 Milburn from Charles Adams around 1957, had it appear in Mechanix Illustrated at some point, then later, the car was picked up by the Stone Mountain Museum (rims painted cream color and headlight trim chromed) to eventually be sold to Hyman Ltd.
To be determined: (1) Yr/Mo of the Mechanix Illustrated photo, (2) Tire Sizes on both front and rear for the Hyman car and Ron Milburn's car. 25Jun2016 Update: Email confirmation by owners that this is the same as the "1916" Milburn in the Otto Siderits Collection. Item 11. 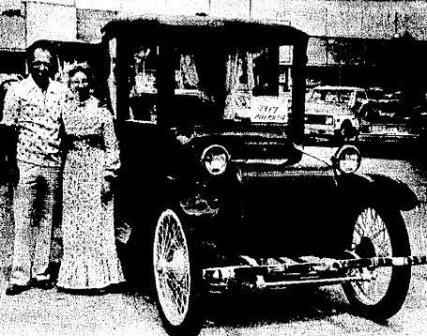 "1919" Milburn owned by Jesse Newman of Chillicothe, MS---May 1, 1954 (photo) and Apr 30, 1954, Chillicothe Constitution-Tribune, pgs 1 and 4---long article�also a May 6, 1954 article in same paper..may have picture? Plus a dozen other snippet articles on this car. From his daughter we now have another photo of this car. 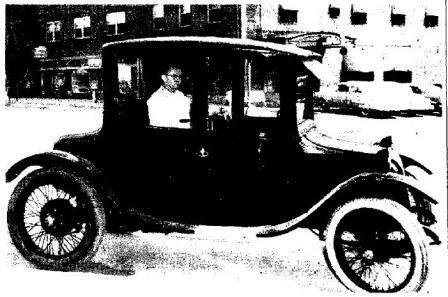 That photo (as does this one) suggests that the car had white wall tires in front and the headlamps show their cords coming directly out the back---indicative of a 1921+ Model and not a 1919. This car was "shiny black" with plush blue interior and had 1753 miles on it in 1954 according to the article. July 2010: Mr. Newman's daughter is wondering what happened to this car that was her dad's. 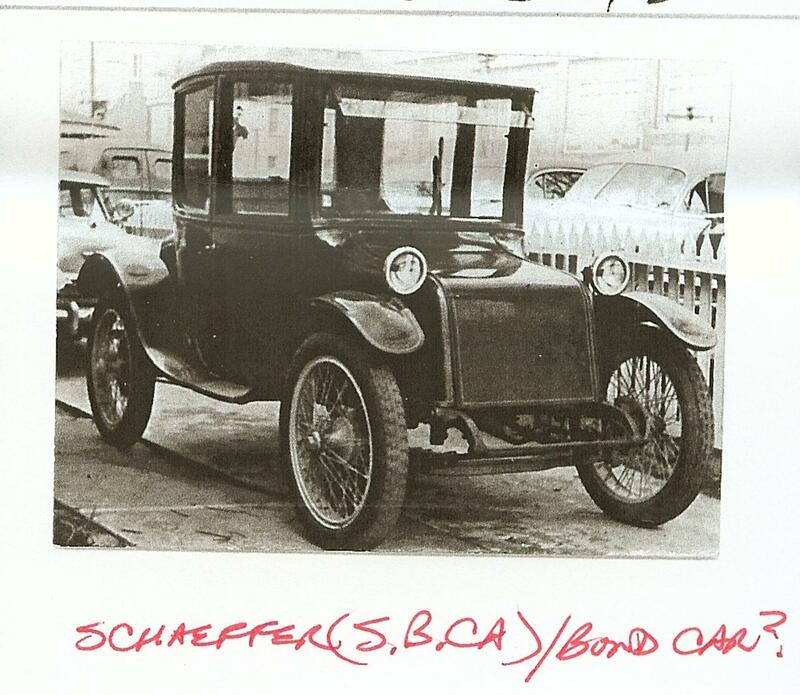 She adds: The car was purchased from Augusta Cloud (an "old maid") of Indianola and later sold to a Don Porter. May 2017 Update: This car is now considered to be one and the same as the Hannah/Shaeffer/Bond/Kamyshmash car #2-3174-7.